In a small saucepan, combine the three citrus juices and simmer over moderate heat until reduced by half, about ten minutes. Pour into a heatproof bowl and let cool to room temperature. Whisk in the shallot, chives and the 4 tablespoons of olive oil. Season with salt and pepper. Add a mixture of half beef bouillon and half salted water to a large skillet, just enough to amply cover the asparagus.. Add asparagus, cover, and bring to a boil. As soon as the liquid boils, turn the heat down to low and cook for three or four minutes, checking the asparagus for doneness. 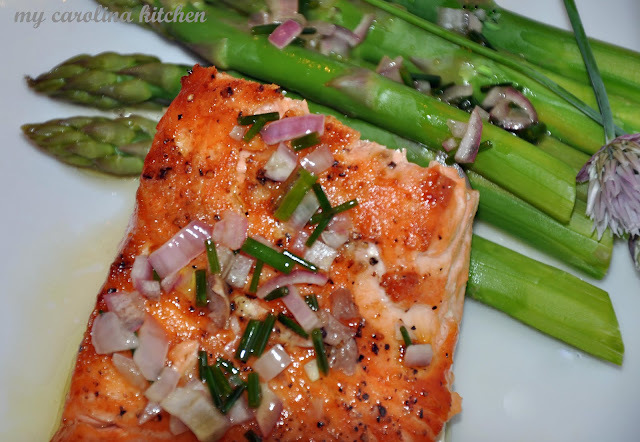 With large, fat asparagus, it may take five minutes. When done, remove asparagus with slotted spatula and dry well on a kitchen towel. Transfer to a platter and drizzle with good extra-virgin olive oil. Preheat the oven to broil. Arrange the pieces of fish in one layer, skin side down, on an unheated broiler tray or large sheet pan lined with heavy duty foil for easier clean-up. Smear with the canola and season with salt and pepper. Place the fish under the broiler about three inches from the source of heat. Broil about six minutes or just until the pieces are cooked through. It’s not necessary to turn the fish. If the fish begins to brown too much, turn the oven to 400 degrees F and bake for a few minutes until they achieve your desired doneness. Transfer the salmon to plates and spoon with some of the citrus vinaigrette. Serve the asparagus alongside and pass the extra vinaigrette.